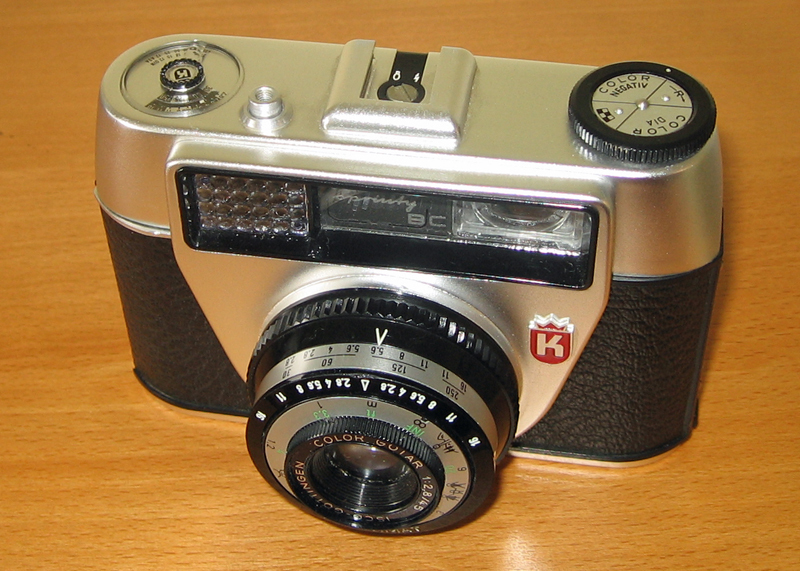 Founded in 1936, King started manufacture of simple cameras in 1949. The company produced a large number of uninteresting cameras in its lifetime (some estimates are as high as 5 million units). The company also produced flashguns and other photographic accessories. For its time, this is a very simple point-and-shoot camera. The shutter and aperture are locked together – if you set it to 1/125 you have the option of f11, f8 or f5.6 only. Much plastic is used (especially in the lens housing), but overall the camera feels fairly well put together – considering its target market. ‘Bulb’ is set using a small lever underneath the viewfinder, and you can choose between electronic of bulb flash using a screw in the hot-shoe. I’ve not had chance to use this camera yet, but it seems that it’s never had a film in it at all.